The cover states that this is â€œA novel of Alternate History,â€ a genre Turtledove is a master of. However, it is actually a novel of an alternate universe, with some familiar history. In this alternate universe, Atlantis is a continent, lying in the Atlantic Ocean between Europe and Terranova (North America), somewhat closer to the latter. In the year 1451, an English fisherman from Hastings, Edward Radcliffe, buys the secret of the location of excellent fishing grounds off the coast of Atlantis, from Francois Kersauzon, a Breton. The two sail to Atlantis, farther from Europe than any English sailor has ever gone before. The cod catch is as good as Kersauzon has said, and Radcliffe pays off from his catch. In addition to the excellent fishing, Atlantis has plenty of game, good land for farming, and forests for lumber. Moreover, it is uninhabited by humans. In short, itâ€™s North America in our universe, but without the Indians. The secret cannot last, however, and soon sailors from England, France, and Spain have found Atlantis. The book is divided into three parts. The first part is the story of Edward Radcliffe. After several fishing voyages to Atlantis, he brings his family and some others from Hastings to Atlantis. They found the town of Hastings. Radcliffe, without any official title, is the acknowledged leader of the town. They are joined by others who are drawn by the promise of land for the taking, and are driven from England by taxes, haughty lords, and the civil wars that are wracking England. While these settlers retain loyalty to England, they are glad to be ignored, for the most part, by the English government. The second part of the book is the story of Red Rodney Radcliffe and William Radcliff (final e dropped several generations before). Both are great-great-grandsons of Edward Radcliffe, through different branches of the family. William is a successful trader, with a fleet of ships based in the town of Stuart, on the east coast of Atlantis. He deals in salt fish, timber, and other goods, and his ships ply from Terranova to Archangelsk. Rodney is a pirate, based at a natural harbor on the west coast of Atlantis. He preys on shipping between Terranova and points east, including the ships of his second cousin William. The two are inevitably drawn into a battle that only one of them can survive. The third partÂ of the book is the story of Victor Radcliff, grandson of William, and Roland Kersauzen, descendant of Francois. It is the middle of the Eighteenth Century. The wars between France and England have reached Atlantis. Victor leads the English settler troops, while Roland leads the French settler troops. Roland leads an invasion of English-settled Atlantis, while Victor counters with an invasion of French-settled Atlantis. The story parallels much of the real history of English and French settlement of North America. Indeed, some real historical personages appear. To this extent, the story really is alternate history, and Turtledove does it very well. I especially liked two things about this book. First, the story is plausible, once you get past the existence of Atlantis. Turtledove knows history, and uses it well. The second is the delineation of the characters. There are no cardboard characters here. Even the evil Red Rodney is fully drawn as a human being with virtues, vices, foibles and loyalties. The rest of the characters are likewise fully drawn, even minor ones such as Rodneyâ€™s mistress. If you like alternate history, or simply want a good read, I donâ€™t think youâ€™ll be disappointed in this book. Since the book stops in the middle of the Eighteenth Century, itâ€™s obvious that Turtledove had a sequel in mind, and itâ€™s already out. Iâ€™ll review it as soon as it arrives. 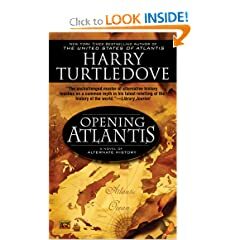 1 user commented in " Book Review: Opening Atlantis by Harry Turtledove "
Journey Home by Paul Burke is an excellent novel. One your readers might like. The URL provided will take you to the home page for reviews and a brief chapter selection. Enjoy!